Recluse son of Nazi art dealer leaves priceless trove of over 1,000 works to Bern Art Museum, which promises to return looted art to owners. A Swiss museum said Monday it would accept a German recluse's bequest of a spectacular trove of more than 1,000 artworks hoarded during the Nazi era. Christoph Schaeublin, president of the Board of Trustees at the the Museum of Fine Arts in Bern, pledged to work with German authorities to ensure that "all looted art in the collection is returned" to its rightful owners. Around 500 works of dubious provenance will remain in Germany so a government-appointed task force can continue its research in identifying the heirs. Gurlitt, who died in May aged 81, was the son of an art dealer tasked by genocidal Nazi leader Adolf Hitler to help plunder great works from museums and Jewish collectors, many of whom were murdered in the gas chambers. In the course of a routine tax inquiry, 1,280 works were unearthed in Gurlitt's cluttered Munich home. More than 300 other works were discovered in a ramshackle house Gurlitt owned in Salzburg. 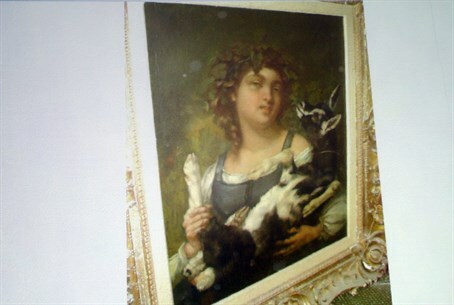 German authorities confiscated all of the Munich pieces and stored them in a secret location. Gurlitt struck an accord with the German government shortly before his death to help track down the paintings' rightful owners. But his anger at having the looted paintings taken out of his possession reportedly led him to stipulate in his will that the collection should go not to a German museum but to the Swiss institution. She said the German government was committed to returning the looted works to Jewish descendants "as soon as possible, with no ifs, ands or buts." But "we're at the beginning, not the end, of a long road," she admitted. Gruetters said that some of the around 500 works staying in Germany with doubtful provenance would be displayed in exhibitions to encourage heirs to come forward and stake claims. And under the terms of the agreement, nearly 480 avant-garde works seized by the Nazis after being deemed to be "degenerate art" not befitting the ideals of the Third Reich would be loaned by Bern primarily to institutions from which they were taken in the 1930s. cause an avalanche of lawsuits." Indeed one of Gurlitt's cousins, 86-year-old Uta Werner, said Friday she was contesting Gurlitt's fitness of mind when he wrote the will naming the Bern museum as his sole heir. pressure on Germany to establish a task force to investigate the works' provenance. Gruetters said that three such works including the Matisse would be returned "without delay" to the heirs. Rosenberg's descendants include French journalist Anne Sinclair, former wife of ex-IMF chief Dominique Strauss-Kahn. "My clients have been extremely patient with German authorities throughout the process and enough is enough," Christopher Marinello, a London lawyer representing the Rosenberg family, told AFP ahead of the news conference. Meanwhile the acquisition of the Gurlitt hoard would dramatically increase the prestige of the Bern institution, Switzerland's oldest art museum. Stephan Klingen of Munich's Institute for Art History said the public interest in the collection was "enormous."